Here’s a crazy idea: Maybe your kids know what’s best for them. I’ve been wrestling with this one for years. Since my girls were first born, really. My younger one takes this concept to a new level nearly every day that I have the humbling experience of being her mother. Let me give you some context for understanding what I’m talking about. For the last two years, my daughter begged me to take her out of (Waldorf) school and let her go to the local public school. “No way,” was my response whenever she brought it up. “You’re tired.” “You don’t know what’s best for you.” “This is our community, and this is where we belong.” “Just wait a few more years. You’ll love your teacher in middle school.” “I’ve been to public school, and it’s not anything that I want for my children.” “You don’t know what you’re asking for because you’ve never experienced it.” “I won’t subject you to all the testing that takes place in public school.” …and so on, and so on, and so on. But she was sad. Deeply, soulfully sad. She cried almost every day. She told me that she was a bad person, deserving of being expelled. She had tantrums at home, often. She was like waking the dead in the morning, and practically impossible to get into bed every night. She resisted EVERYTHING. I tried. And tried. And tried. And I lost my patience. Almost every single day. Because a person can only take so much. So I screamed, and I said things that I didn’t mean. She regressed, and withdrew, and pulled away from the very love that brought her forth into this world. And it felt awful. For all of us. We tried therapy, and homeopathy, and dietary changes, and flower essences. We had some movement in the right direction after the flower essences. My baby let me hug her again, and she said goodbye to me instead of turning and heading into school with tears in her eyes, unwilling to look back at the person who would make her go back there. She had friends at school, and there were some happy times, too. But these weren’t enough to counter her overwhelming desire to leave. Well, she finally got her way. Not so much because I finally broke down (or wised up), but because we were, how should I say it, gently invited not to return to the school until such time that we could afford to pay more tuition. With the school year about to begin in a matter of days and knowing full well that neither she nor I felt that homeschool was an option, we had just one choice: PUBLIC SCHOOL! But my daughter had this kind of crazy calm that I can only describe as complete and utter “knowing.” She was nervous about the change, but SO excited at the prospect of a new school, new teacher, new friends. I’ve hesitated to write this post, I guess because I’ve been waiting for the other shoe to drop. One day she’ll come home hating it, or begging me to let her go back to her old school, but that hasn’t happened. “Transitions are hard for me,” she admits every Monday morning, thinking she might rather stay home with her sister and me. But then she goes to school, and every day she returns, happy she went and exuberant over everything she’s learned. She’s happy, and light, and sweet. And she knows that she’s a good person, because she IS, and she’s getting that reflected back to her at her school. So, I’m really grateful for that cosmic “nudge” that landed her where she knew she needed to be all along. It sounds so ridiculously simple. But really, parents don’t always know what’s best for their children. Maybe, just maybe, if it FEELS wrong, it really is. 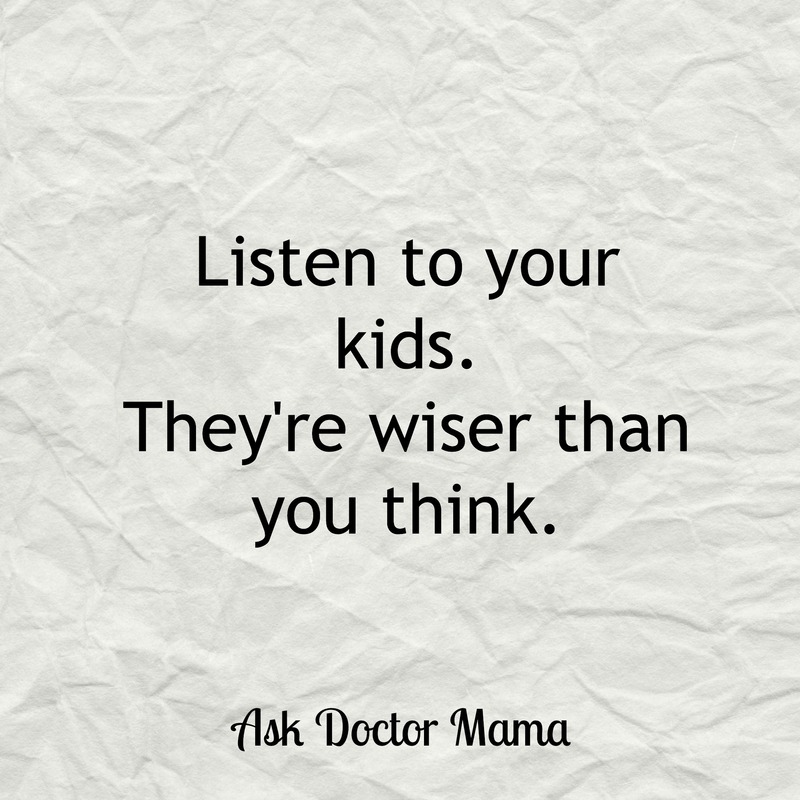 And maybe, just maybe, we should let our children make more decisions for themselves. Even—and perhaps especially—the big ones.